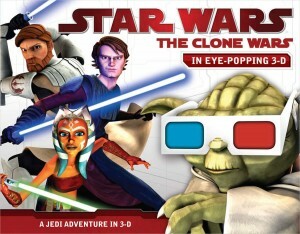 Eye-popping 3-D action makes The Clone Wars action jump off the page. This amazing 3-D storybook told from the point of view of Jedi Padawan Ahsoka Tano features the best battles and action scenes from The Clone Wars animated series. Complete with perforated 3-D glasses, this 64-page storybook adds a whole new dimension to the Star Wars universe.